Jeevan Akshay VI is the flag ship pension product of LIC of India. Before going deep into the features of the plan it is better to getting familiar with some terms which we are going to use in this article. On the other hand if you are familiar with the Jeevan Aksahy VI plan, you can open premium and benefit calculator of Jeevan Akshay plan. An annuity is a series of equal payments at regular intervals. The interval can vary depending on the scheme namely Yearly, Half Yearly, Monthly etc. So Annuity, in simple terms, means Pension. Generally we come across two types of annuities. a) Immediate Annuity – Annuity starts immediately after the premium payment. 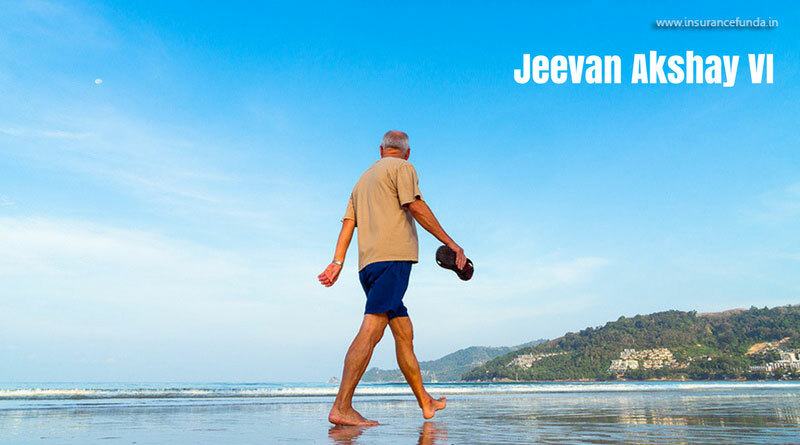 Jeevan Akshay VI is an immediate annuity plan where premium is paid as a single lump sum payment and Annuity or the pension will start immediately after the completion of one annuity mode period. For example, if monthly annuity mode is selected the pension will start from next month on wards and in case of yearly mode pension will start from next year. The greatest advantage of Jeevan Akshay VI is that, the annuity rate at which pension starts will be protected through out your life. The fluctuations in the interest rates, likely to see in the market will not affect your future pension amount. You can use the premium and benefit calculator for Jeevan Akshay plan to get a clear idea on the premium and benefit details of Jeevan Akshay plan. This calculator can give you all details including the pension amount available for various pension options. Who can buy Jeevan Akshay VI ? Anybody whose age is between 30 years and 85 years can purchase this policy, irrespective of the health conditions. No Medical Examination is required for this plan. How much you should pay for Jeevan Akshay VI ? Minimum sum assured of Jeevan Akshay VI is one lakh where there is no higher limit for the premium. If you purchase 2.5 lakh or more you will receive higher annuity. There is no higher ceiling for this plan. How will you get pension from Jeevan Akshay VI ? Pension can be obtained as Yearly, Half yearly, Quarterly, or monthly instalments. The rate of pension varies depending on the instalment mode. Naturally the rate is higher for yearly mode as the payment is done only on completion of the mode period. Several Annuity options are available in Jeevan Akshay VI and the suitable option has to be selected at the time of purchase. Change in pension option later is not allowed. Hover the mouse above the chart shown above to get the pension values. The general tendency in selecting the annuity option is to go for Annuity for life with return of purchase price. But you can consider other options as well, depending on your requirements. If you are not having any dependants for whom death proceedings has to be transferred, Annuity for life is the better option, as you will receive highest pension rate. Just go through the illustration given above to get a clear idea on the pension rates available for different options. Jeevan Akshay VI can be purchased from any branch office or through online mode. For online mode of purchase an additional 1% increase in returns will be available. Surrender facility has been introduced in the plan recently. If the annuitant is diagnosed as suffering from any of the following critical illnesses, surrender of the plan is allowed. Surrender is allowed only in Pension for life with return of purchase price option. Premium paid under the policy is eligible for tax rebate under section 80 C while the pension received from the policy is taxable. Read more on the income tax and how to calculate your tax. We recommend you to read an article on Income Tax return e-filing to understand the complete process in a simple way. The greatest advantage of Jeevan Akshay VI is that this plan can protect you from the trend of dwindling interest rates. The recent changes in national and global economic scenarios reiterates that this trend is likely to continue in the future also. So, even if you feels that the interest rate offered by the scheme is not attractive, your guaranteed rates of pension may become attractive once the interest rates go down. One Negative factor to be considered while purchasing this plan is that, the pension you receive is taxable. So if you are now in the tax bracket, the effective interest you receive will get reduced depending on your income slab. Read more on National Pension System (NPS) if you are looking for a pension scheme sponsored by Govt of India.